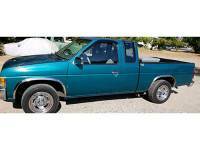 ...95 Nissan Hardbody 4x4, 5 speed transmission, runs and drives great. 198,000 miles. ...1995 Nissan hardbody extra cab 4X4. 5 speed with new tires, AC, sunroof, and heavy brush guard with winch mounts.$2950/OBO.